Just the right touch of macho and yet still glamorous. 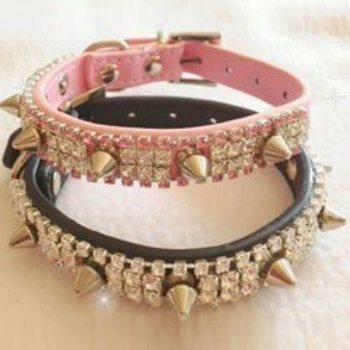 Here you have a choice of pink or black faux leather collars. Size S & M are 5/8" wide, Size Large is 3/4" wide and Size XL is 1" wide. The Glamour Spikes designer dog collars are sized a bit differently than our others.